For all its choreographic precision, polished performances and classy sponsorship (a two-year residency at the Firehall Theatre), Hong Kong Exile’s latest offering, Room 2048, has something of the playfulness of a backyard kids’ game. A lot of hyper-kinetic jittering, punctuated by slo-mo interludes and stop-action freeze frames – all inspired, according to the programme notes, by the non-linear aesthetic of avant garde film-maker Wong Kar-wai. But, more than New-New-Wave cinema, Room 2048 called to my mind the herky-jerky fits and starts of such sandlot child’s play as Simon Says or Red Light/Green Light. As any survivor of a neurotically nerdy childhood might recall, such “fun” is not without its tensions. These games are all about imposed control and how to steal back a little of one’s own agency. Apt metaphor for Hong Kong’s worsening dilemma. Ever since its 1997 reversion to Chinese rule, the former British Crown Colony has been running down the clock on its 50 years of promised quasi-autonomy. The “2048” of the title refers to the terminal year of Beijing’s “One Country Two Systems” guarantee to maintain Hong Kong’s capitalist economic order, independent judiciary, press freedom and (rather truncated) representative democracy. In practice, long before 50-year deadline, these prerogatives already look more and more tenuous with each passing news cycle. So Hong Kong’s residents, along with its diaspora “exiles,” find themselves caught in an ongoing struggle to hold their own against diktats from on high. Room 2048 lays out this plight in a series of vignettes, or “chapters,” that are engagingly playful – but with an edge. 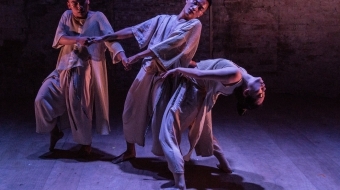 In this game of “Simon Says,” the three onstage performers – Michelle Lui, Milton Lim and Alex Tam – must dance to the tune (literally), bask in the light and move by the say-so of an unseen, offstage Simon. That’d be sound-and-light designer Remy Siu, whose blended score of original electronica compositions and Canto-pop quotations drives the tempo. “Atmospheric” is a tag often applied to the Wong Kar-wai aesthetic. But Room 2048 goes a step beyond, deploying a smoke machine to fill the Firehall with an atmosphere so thick it gets up your nose. Into this haze, Siu beams palpable cones of light from a pair of gimbal-mounted overhead spot projectors to lay down stroboscopic, moiré patterned “shining paths” on the stage. 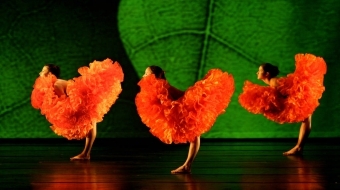 With the performers posed, stage centre, at the vortex of these cones, Siu can present an illusion of changing perspective or headlong motion just by swivelling the spotlights or tweaking the strobe. And the hyper-illuminated central figures contrast starkly with the murky, faceless figures in the penumbra. 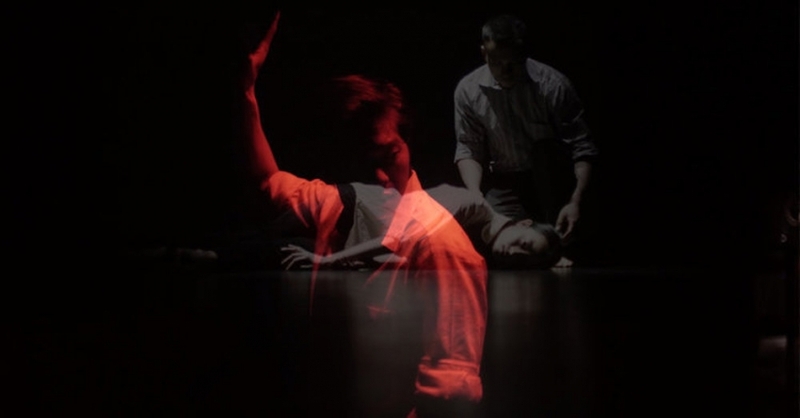 To underscore this contrast, in many of the “chapters,” choreographer Natalie Tin Yin Gan sets drastically different tempos for her central and peripheral performers. In her cone of light, Lui twitches to a frenetic disco beat as Lim, in the red-tinted shadows, stalks 3600 around her languidly smoking. But then, in the next “chapter,” Tam takes centre stage motionlessly, like a deer transfixed in a headlight, while shadowy figures course past behind him to suggest a crowded street scene. Whether stock-still or on the run, the performers remain resolutely affectless, even when locking eyes and stripping down (or, more accurately, exfoliating) for what looks like an immanent romantic clinch. And the vignettes, which started out in a tidy, ordinal sequence, gradually mount in a heap of randomly numbered, stroboscopic day-and-night blinks until “chapter” 10,000 (萬). Which, symbolically, betokens an uncountable myriad in Chinese, but also happens to more or less number the days left until the 2048 deadline. At which point, in their ongoing game of “Simon Says,” Hong Kong and its exiles may need to ask “May I?” before venturing any moves at all.